Outstanding study of rates, varieties, errors of this "longest set" in U.S. stamp producing history. B. J. Castenholz, FIELD GUIDE TO REVENUE STAMPED PAPER: This seven part series describes and prices stamped paper by the user rather than only by the stamp. It is an indispensable set of reference works. Very useful introductory book with sections on 1st Issue and revenue stamped paper being especially helpful. Joseph S. Einstein, Thomas C. Kingsley, W. Richard DeKay, A HANDBOOK FOR UNITED STATES REVENUE STAMPED PAPER: illustrated study dealing with stamps, essays, proofs, specimens, and facsimiles. King, Bacharach, Turner, REVENUE UNIT COLUMNS FROM THE AMERICAN PHILATELIST: Compilation of the studies of revenue enthusiasts before the existence of the ARA. Mostly on plate and printing varieties. George Kramer, U.S. TELEGRAPH STAMPS & FRANKS: Includes both Scott listed and non-Scott listed companies. The definitive work on the subject. firms that used them. A thorough treatment of rates and usages, which are sometimes complex. 736 pages, 10 color plates, HB, also includes a fully searchable disk. 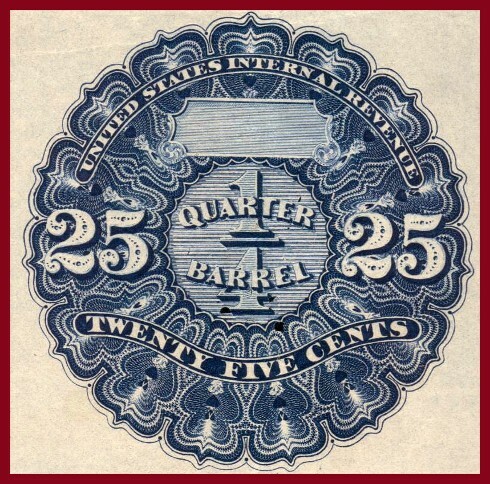 Thomas W. Priester, UNITED STATES BEER STAMPS: A descriptive catalog with current market prices. 57 pages, illustrated, HB, The first edition has sections of information not found in the second edition. The second edition mostly updates prices. E.B. Sterling, Sterling's Standard Descriptive and Price Catalogue of the Revenue Stamps of the United States: One of the first priced Revenue catalogs. In XF condition. Toppan, Deats, Holland, THE BOSTON REVENUE BOOK: The classic reference work on revenues, first published in 1899 by the Boston Philatelic Society. E.R. Vanderhoof, A checklist (priced) of the Beer Stamps of the United States of America: The reference for decades before Priester came along. M & M stamp with look-alike varieties grouped together. The photos are the essential feature of this work.